Down load Zip file and unzip it, then excute setup.exe. 2. Select using sound board. 3. Select PTT com port. you can select another call2 or call3. HB9HQX should be none com port. 2. Set Name master file. 6. Select TX window and RX window font size. <RX> : Receive after sending all. 5. Aftef modification, click Save Close button. Right Click blue button, then modify macro. 1. 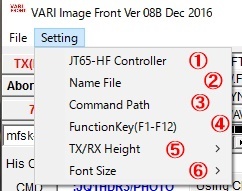 PSK Front Dir is correct same as VARI Image Front. condition. But　JT65 mode would be best for decoding. 3. Send carrier is 1600Hz. 4. Reciving signal and decorded text. 6. If checked, receive my self for testing of setting. and transfer them to server. 1 to 6 are Auto TX and RX by Macro. 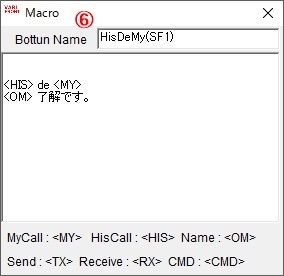 F8 ,SF1, SF2, SF3, SF4, SF5, SF6, SF7, SF8 are your macro. 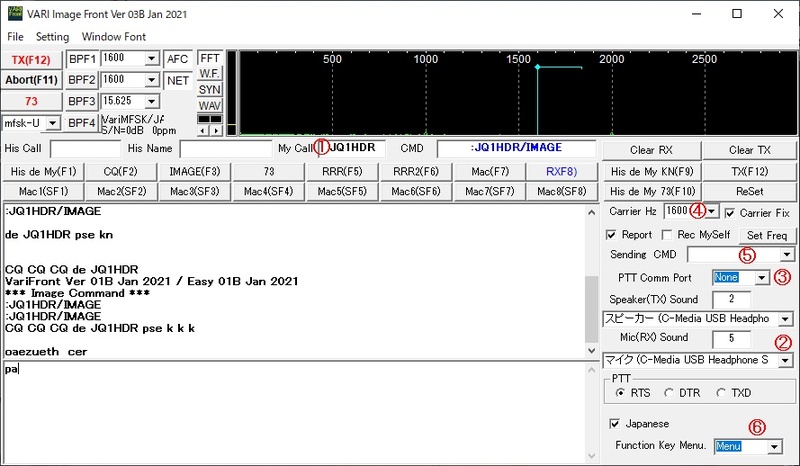 then click F12 key, transmitting will be start. If stop imediately, Click F11(Abort Key).